Since Americans tend to roast their winter squash a lot, I thought that I could try it with the pumpkin half and the garlic. 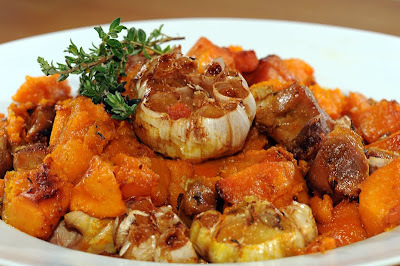 Then I rushed to the supermarket to get pork roast because I knew (I just knew) that if I had served my roasted garlic and pumpkin vegetarian to my children, let alone to my husband, it would have been one of these "sigh" dinners: it's good but something is missing! As for me, I would have been happy with the vegetarian version! The results was delicious; my children did try the roasted garlic and did not dislike it (ie, no spitting from my two-year-old!). They ate the pork roast and the pumpkin, asking when were were, at last, going to make a "Jack O Lantern". It was close to Halloween, afterall! Bon Appétit! Pre-heat oven to 375F (190C). Cut off the head of the garlic, exposing the garlic cloves. In a baking pan, put the pork, pumpkin, garlic and fresh thyme. The garlic heads have to be facing up. Pour the white wine over the vegetables and the meat. Pour olive oil over, making sure the garlic cloves get a lot of olive oil. Cover with Aluminum foil and put in the oven for 45 minutes. Remove the foil, if any liquid remaining, pour it over the meat. Put back in the oven for another 20-30 minutes. It's cooked when the garlic cloves start to get out of their shell and are golden brown. You could add potatoes to the dish, cut into pieces, skin on. I used Tenderloin pork that day because I did not want to stroll to another supermarket where I can find other cuts. Pork meat tends to be dry; the more fat, the better. It makes a great leftover dish.